The proportion of UK state school pupils accepted by Oxford University rose to 55.4% last year, a rise of two percentage points. The proportion of state school pupils going to Cambridge is higher - 59% of its 2008 intake was from state schools. But Oxford says a benchmark or target figure of 76%, set by the UK's university statistics body is "unrealistic". It says it is committed to attracting the best students from all backgrounds. 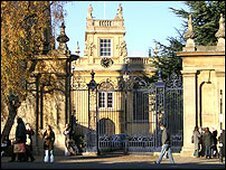 Of those who entered Oxford in 2008, 55.4% (1,515) pupils came from state schools and 44.6% (1,221) from independent schools. The Higher Education Statistics Agency (Hesa) has set Oxford University a target or "benchmark" of taking 76.7% of its undergraduates from state schools. It sets different benchmarks for each institution, and it says it compares like with like to show how each institution is doing compared with others of a similar type. But Oxford says it can only draw from those who achieve three A grades at A-level, so Hesa's benchmark is "an unrealistic goal". In setting its benchmarks, Hesa includes pupils gaining the equivalent number of Ucas points to three A grades. But Oxford points out that students could have gained these points by obtaining various qualifications, not all of which would be relevant for Oxford. Oxford says it is redoubling its efforts to reach students from all backgrounds, but can only deal with those who apply. The University's director of undergraduate admissions, Mike Nicholson, said: "We're working hard to make sure all talented students can get hold of the information they need to consider applying to Oxford, but, despite offering podcasts and e-mentoring, the university can't be with every student all of the time." He said for that reason they were developing ways of working with teachers, and holding teachers' conferences in all nations of the UK. The total number of applications to Oxford was down slightly in 2008. The university selects on academic ability and potential through interviews, aptitude tests, predicted and attained grades.